Can be used with all brands of Ball Washers to mount toany flat surface 3" or wider. 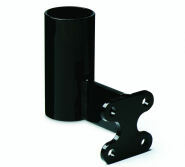 Powder-coated black Aluminum bracket used to mount any ballwasher that uses a 2 3/8" mounting pipe (which is most of them). The Wall Bracket mounts to any flat surface 3" or greater. A Separate Mounting Pipe is not needed. Everything is included with this mounting bracket kit. Can be spray painted (by customer) if another color is desired. 8/21/2018 – I have a Par Aide golf ball washer which has the 2 3/8" hole in it. Do I need to buy the pipe also or will the washer fit . . .